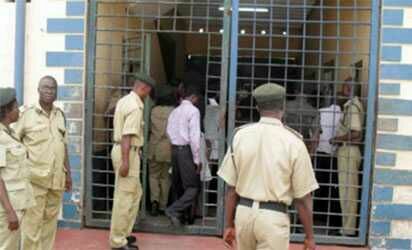 A Federal Capital Territory High Court, Abuja, yesterday, sent two serving military officers and two female bank managers to Kuje Prisons over alleged connivance and stealing of N339 million meant for thepayment of military pensions. They will, at least, spend the next four days in the prison. Justice D.Z. Senchi, who ordered the remand of the four suspects in prison, said their applications for bail would be heard next Monday. In the criminal case filed by the Economic and Financial Crimes Commission, EFCC, against the suspects, the commission prayed the court to jail them for causing untold hardship to military pension beneficiaries and their families who were robbed of their entitlements after serving the nation for many years. The two military officers sent to Kuje Prison include Wing Commander Ishaka Yakubu and Lieutenant Commander Akinbamidele Odunsi, while the two bank officials are Mrs. Abidemi Aderemi Kolade and Violet Ofoegbunam. They were alleged to have conspired to collect monies meant for payment of death benefits to deceased Army officers, and converted same to personal use. The EFCC said in the six-count charge of conspiracy and stealing of pension funds preferred against the four suspects that the offence breached Section 315 of the Penal Code Act Cap 532 LFN (Abuja) 1990, and punishable under the same Act.